The conjunctional adverb zwar has no single equivalent in English. In one context it seems to mean one thing, in another it seems to mean something else entirely. Sometimes it seems to add nothing meaningful to a sentence at all. If we look at several examples, however, two basic and easily recognizable meanings begin to crystallize. Context is key, because how zwar is used within the configuration of the sentence as a whole is what determines its meaning and function. Let’s take a look at the following examples. Die Teilnahme ist zwar nur mäßig gewesen, die Teilnehmer haben aber mit großem Interesse mitgemacht. Participation may have been modest, but the participants joined in with great interest. Das ist zwar ein guter, aber kein neuer Gedanke. That is a good thought, but it’s not a new one. Diese Maßnahmen sind zwar wichtig, stellen jedoch nur erste Schritte dar. These measures are certainly important; however, they represent only first steps. Rechtlich ist es zwar zulässig, allerdings macht niemand Gebrauch davon. Although it is legally permissible, nobody does it. It’s true that I know a lot, but I would like to know everything. Each of the above sentences contains two statements. Zwar always appears in the first statement, while the second statement contains a rebuttal or a qualification of the first. The word zwar alerts the listener/reader that information is coming that will put parameters or limits on what is being stated. And indeed, the zwar of the introductory statement is coupled with an adversative or concessive adverb in the second statement (marked in blue above) — commonly aber, doch, or jedoch, but also dennoch, trotzdem, allerdings, immerhin , even allein. Note that the two statements do not have to be in the same sentence. But the sentence with zwar still must precede the sentence containing the limiting adverb. Die Zahl der Alkoholunfälle ist zwar gesunken. 2007 starben dennoch 565 Menschen bei Alkoholunfällen. The number of alcohol-related deaths has fallen. Nevertheless, in 2007 565 people died in accidents caused by alcohol. Der spricht zwar nicht wie ein Buch. Dafür hat sein Wort Gewicht. Admittedly, he doesn’t speak like a book. But his words carry weight. As all of the examples above demonstrate, there are many elegant ways to express this pairing of zwar with a limiting adverb in English. However, simply adding an although to the start of the first statement —even if it’s not the most elegant or preferred way of rephrasing the idea in English — can usually help get at the intended meaning of zwar and the limiting adverb it is paired with. The second usage of zwar is different both in configuration and meaning. 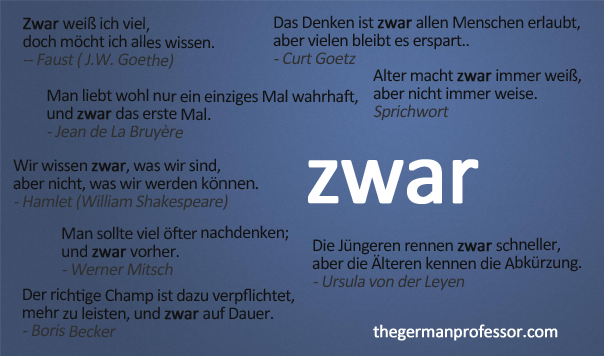 Notice in all of the following examples that it appears in the two-word phrase und zwar. Die Familie reist im Urlaub in den Süden, und zwar nach Italien. The family is travelling south on vacation. They are going to Italy. Wir waren auf der Messe in Hannover, und zwar meine Schwester, meine Cousine und ich. We were at the expo in Hannover, and by “we” I mean my sister, my cousin, and I.
Danach machte ich eine Ausbildung zur Krankenpflegerin, und zwar für den Bereich der Altenpflege. After that I did a training program in nursing — more specifically, in the area of geriatric care. Wer das nicht nicht wahrhaben will, der soll unser Land verlassen, und zwar sofort! Whoever doesn’t want to accept that should leave this country — immediately! Diese Antwort ist aber falsch, und zwar aus folgenden Gründen. This answer is wrong for the following reasons. In this particular usage, zwar is usually preceded by und. What follows is not a limiting statement, but rather a further clarification of what was previously stated. It introduces a statement that supplies more detail or more precision. There are many ways to accomplish the same thing in English, as can be seen by the various translations above. So really, the difficulty of zwar for English speakers is not in its function per se, because it has two very clear and distinct uses. I think the difficulty rather lies in the myriad options English speakers have for rendering its meaning in English. If you look for the identifying clues outlined above, you can easily determine whether zwar is meant to limit or clarify. Could indeed be a correct transalation? At least in some cases. Yes, it could. There really is no single correct way to translate it into English. Thanks for posting it. The phrases are very useful for me.